This afternoon, Megan and I hiked to the summit of Mount Pleasant, near Bridgton Maine. A 1.8 mile hike that ascends over 1500 feet, the view from the top of the mountain is spectacular. To the west lies the Presidential Range of New Hampshire, most famous for Mount Washington, home to the world's worst weather. And today was no exception. 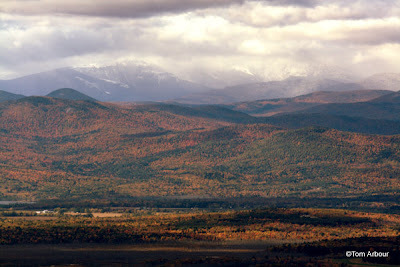 We were high above the hills of Maine and hovering in the low forties, but across the way on top of these mountains, it was snowing. The high temperature for Mountain Washington today was a cool 20 degrees, and when I just checked the temperature at 6:19 p.m. Wednesday evening, it was down to 10 degrees with a -16 windchill. From our vantage point, the mountains were shrouded in what looked like icy, snowy fog, which was quite a contrast to the valley below that was experiencing the peak of autumn. You have captured that contrast beautifully. Awesome photo!